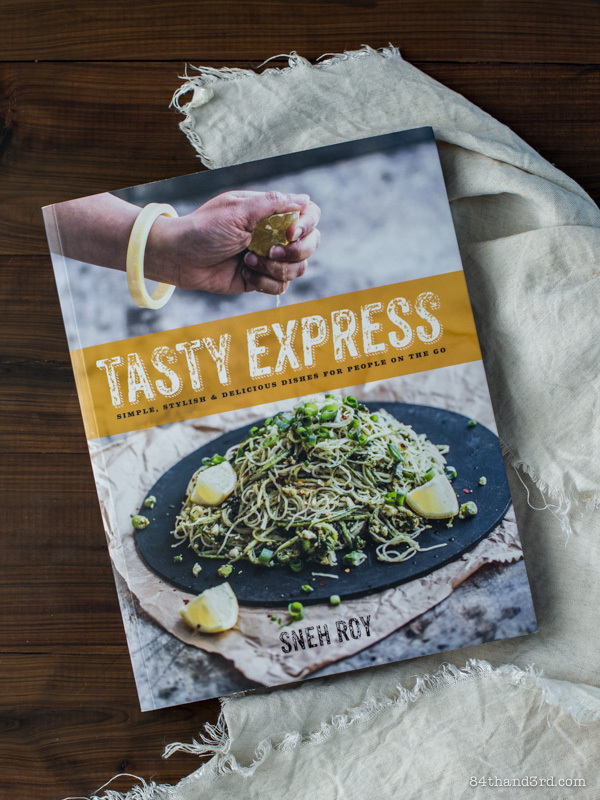 Tasty Express – Simple, stylish & delicious dishes for people on the go is the first book from Australian-based blogger/designer/photographer Sneh Roy of Cook Republic. A pocket-powerhouse of enviable talent, Tasty Express is more than just another feather in Sneh’s already overflowing cap. 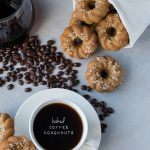 An amazing photographer with a unique style, Sneh has been blogging and sharing recipes for over eight years. Then last year she not only won a host of blogging awards but secured a book deal — and in 40 days managed to write, test and photograph it — all while finishing up her last semester of a design degree and juggling the day-to-day of two young boys. The fact that the result is so enticing is a testament to her dedication (and apparently unending supply of creative juice). In this day and age of fad diets and hard-line limitations Tasty Express is refreshingly real in its approach. Wholesome recipes are predominately vegetarian, and for the most part accessible even on a busy weeknight. The overall tone is spiked with the flavours and colours of Sneh’s Indian heritage, making for a new and sometimes unexpected twist on classic dishes. Hot Chocolate marries with chai spices, Coconut Bircher is topped with rose infused berries, a traditional Aussie Toastie is turned on its head when filled with a masala and chilli omelette. Then an Eggplant Lasagne Steak peeks in, hot on the heels of Sticky Caramel Chicken Wings, Burnt Butter Caramel Slice, and an insane Custard Thickshake with Carnival Cookies, and you are treated to a taste of Sneh’s time in Asia and her appreciation of solid flavours and occasional indulgences — no matter the country of origin. 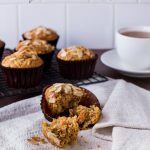 Now of course the recipe that caught my eye is one of the more involved ones but it sounded so interesting I simply couldn’t resist — the leap of faith paid off with a fascinating burst of flavours and textures. I have been toasting and subsequently smearing slices of the tangy bread with copious amounts of creme fraiche, because I can. 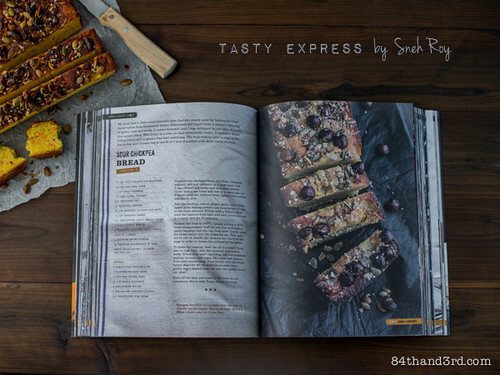 Of course I not only have a recipe to share but a copy of Tasty Express to giveaway to one lucky reader. Giveaway open until 11.59pm Saturday 10 May (Sydney time). Winner will be selected based on the best comment about why you would like to win this book. Winner will be notified via the email address linked to their entry. Open to persons with Australian mailing addresses only. 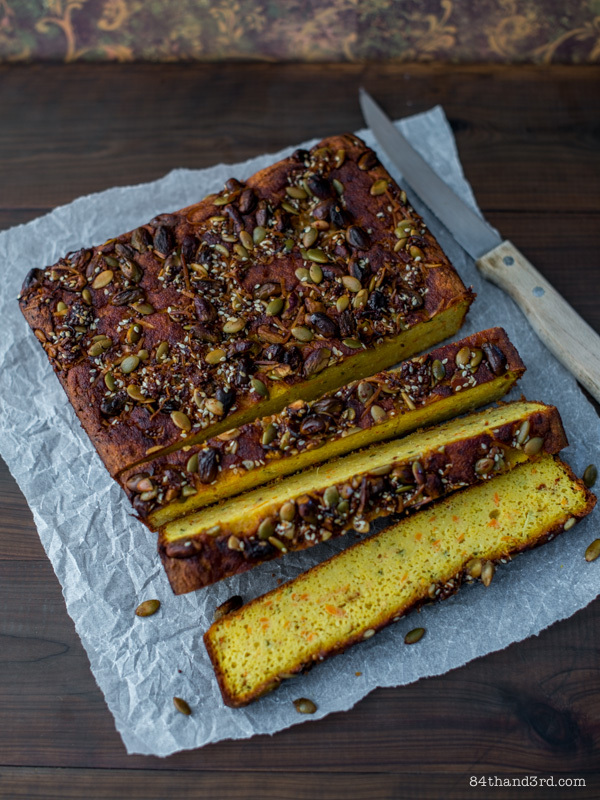 Dense and spicy with a fragrant, crunchy topping, this gluten-free Indian twist on cornbread is a perfect savoury alternative any time of day. Toasted with a schmear of creme fraiche for breakfast, topped with green chutney (as suggested by Sneh) for lunch or floating on soup for dinner, it’s versatile and well worth the resting time required in the recipe. || Very slightly adapted from Tasty Express. Combine chickpea flour, rice flour, cornmeal, yoghurt, salt, turmeric and hot water in a large bowl. Whisk until smooth and set aside in a warm spot, covered with a tea towel, for 2 hours to rest and develop the sour flavour. Add zucchini, carrot, ginger, garlic, chilli, juice, baking powder and soda to the batter. Use a whisk to whip mixture for a minute or two, until light and airy. Cover and rest in a warm spot for 20 mins. Pre-heat oven to 200°C (400°F). Grease an 8 inch (20 cm) square tin with a bit of coconut oil, line base and two sides with a strip of baking paper. Scrape batter, without stirring, gently into lined pan and prepare the topping. Heat oil in a small frying pan and add mustard and sesame seeds. When seeds start to crackle and pop stir in remaining topping ingredients, mix to combine and remove from heat immediately. Spoon/pour evenly over batter. Bake for 45 – 50 mins, until golden and a skewer inserted into the centre comes out clean. Cool in pan 30 mins, run a knife around the edge and tip out carefully. Cool completely before cutting. Sneh’s recipe says to turn off the heat after the baking time has elapsed and allow the bread to cool completely before removing it from the oven, I however had a lamb shoulder roasting at the same time and with hours remaining could not do this step. I left the bread in the oven for an extra couple minutes then let it cool on the counter per above instructions, with no adverse effects. 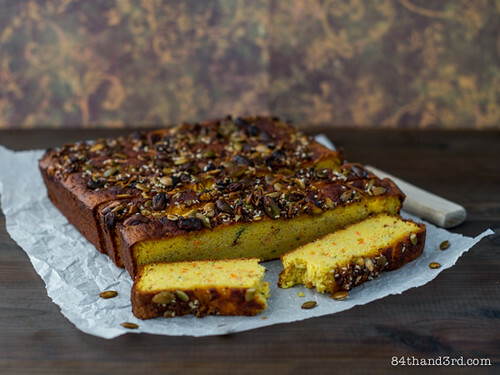 Due to what ingredients were in my pantry I ended up using half fresh ginger and half dried ginger powder; black mustard seeds; pistachios instead of the original recipe’s hazelnuts. Book for giveaway supplied by Sneh Roy; support, opinions and general gushing are all my own. Editorial policy yadda yadda yadda here. Wow, I’m amazed by how quickly she wrote the book! I’d love to win it because you have sold it so well – it looks and sounds sensational, vibrant, and full of deliciousness. I know, unbelievable isn’t it! 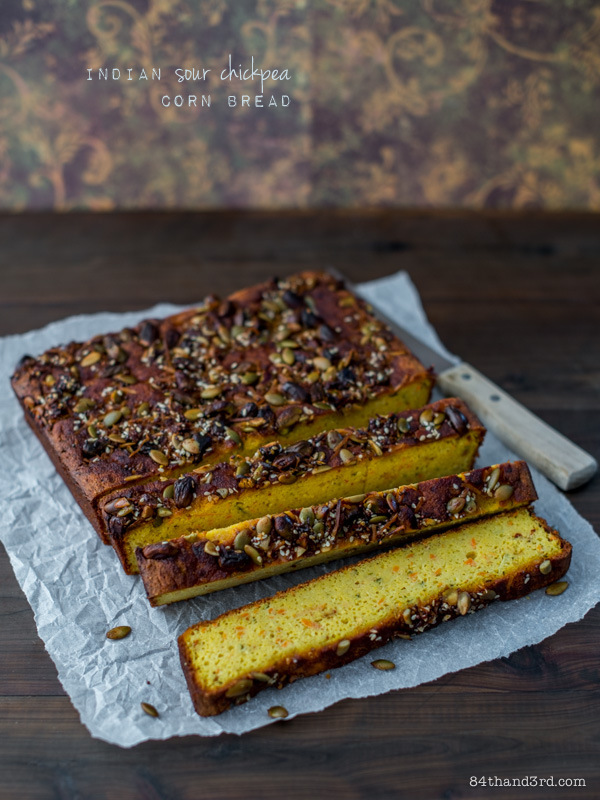 Man, that cornbread looks delicious… In an age where we appear to have reached ‘peak bloggage’, everything about Sneh’s work remains real and unaffected which I love. I’d like to win this cookbook because I’m on a self-imposed cookbook buying ban and this act as a nice little loophole. I have been stuck in a food rut for a while now – I need some cooking inspiration. I need change!! 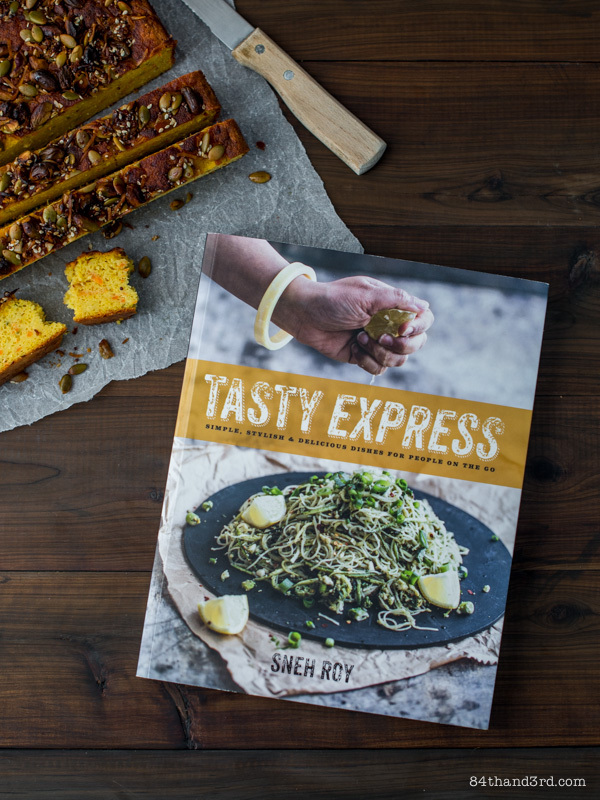 I’m a huge fan of Sneh’s work and would love to try my hand at whipping up the delicious creations in her book! i love corn bread! sneh’s twist on this is amazing! 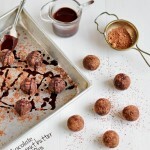 I want to win the cookbook because deliciousness makes the world go around. Well then, I guess I have no excuse not to be achieving a lot more with my blog. What an inspiration! You have just made cornbread a top priority for me, simply stunning! Thanks for sharing. oh and I worked with a Sneh and always thought it a beautiful name. 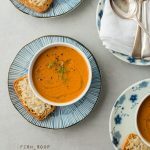 I love Sneh’s no nonsense approach to food, the way she describes it with love and without guilt or avoidance, the way it always looks nourishing to the body and to the soul. Being on a total book buying ban meant I couldn’t pick upa copy myself, but if iI managed to win it! Oh! Those almonds! Delicious.